Location: In Piazzetta San Simeone, a couple blocks south and west from Ponte Umberto I, or about 1 block north and about 5 blocks west from the north end of Piazza Navona. 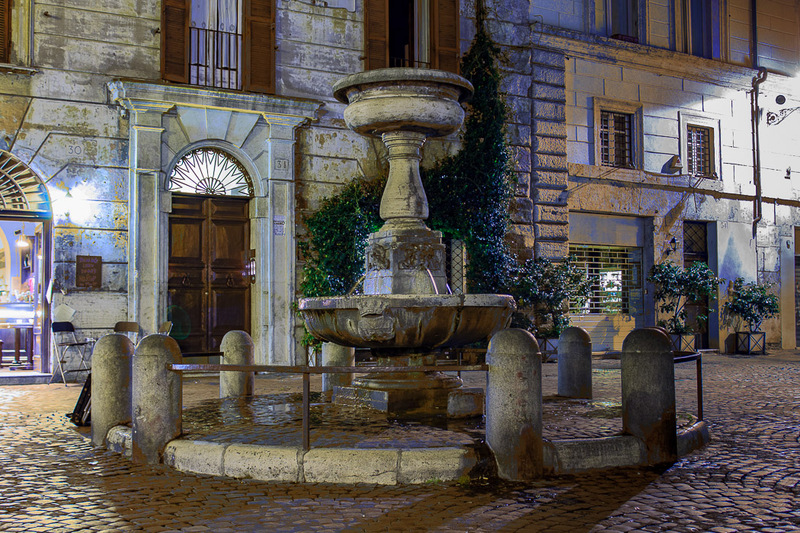 The Fountain in Piazzetta San Simeone was designed by Giacomo Della Porta in 1589 and built by Pietro Gucci, in the Piazza Montanara, located between the Capitoline Hill and the Theatre of Marcellus. That piazza disappeared in 1932 when Mussolini had neighborhoods destroyed in the area to open up the views to the Theatre of Marcellus and create Via del Teatro Marcello, and the fountain was moved to its current location. This simple fountain has water flowing out of the pedestal which supports the upper bowl, through the mouths of faces on four sides, into a large lower basin. See all Fountain in Piazzetta San Simeone photos.